Don Hutson, the man with the hands that could catch any ball. The man was the flash in the blink of an eye as he passed opponents with his then newly developed pass routes. No one dared blink while Hutson was on the field, lest they lose the game. Hutson was the first to be consid-ered the modern wide receiver for his invention of modern pass routes that are still widely used today. And even though today Hutson is heralded to as a legendary player, in the beginning many NFL teams had their doubts about because of his size and thin appearance. He was 6-1 and weighed only 183 pounds. He looked fragile and didn’t give an intimidating aura, but those doubts would soon be crushed. Don Hutson was born in Pine Bluff, Arkansas in 1913. His full name is Donald Montgomery Hutson and he first developed a love for the game as kid passing the ol’ pig skin around with the neighborhood boys. Developing his skills at the University of Alabama, Hutson had extreme dexterity as the balls seem to just slip into his hands. A legend surrounding the enigmatic Don Hutson is as a kid Hutson handled rattle snakes. Huston was a boy scout and messing around with snakes was all part of the day’s work. This forced him to be very cautious and at a young age his skills were cemented in habit. This later translated to catching gold as his abilities on the field became more and more recognized throughout the league. Hutson played high school football, but he wasn’t sought for his skills on the gridiron but on the diamond. He had a knack for baseball and obtained a scholarship to play at the University of Alabama. Hutson also had an affinity for speed as he also took part of the university’s track team. Hutson was so fast that he even ran the 100 meter dash in under ten seconds. However, he decided to try his snake-hands at football as a walk-on and the coaches saw the potential in him. During Hutson’s senior year he led Alabama to defeat Stanford at the 1935 Rose Bowl game. Hutson completed 165 yards with six caught passes and scored two touch downs. He celebrated victory for his university, but the NFL teams weren’t sure of this skinny player. Don Huston was armed only with his uncanny speed, hands that could catch anything, and a mind for tactics, but his appearance didn’t give that of a legendary football receiver. He was scrawny and the general managers were worried that he wouldn’t be able to keep up at the professional level. However, two teams decided to take the risk and hire Don Huston as part of their lineup. Because of Don Hutson’s ability to maneuver around players with high-flying passes never be-fore seen he has be dubbed, “The First Modern Wide Receiver.” From 1935 to 1945 Hutson developed an array of techniques that the NFL had never before seen. He set a stage of achieve-ments such as being the 1941 and ’42 MVP, 488 catches, scoring 811 points, and slew of others. Hutson set the momentum for the new era, something no other player has done. He was the maverick in an age where mavericks were non-existent. But can you achieve this too? Is possible for you to issue a new wave of momentum for a new era? I think so, if you stay true to yourself and follow these guiding principles. Right now, at this exact moment, there is something that people think it’s impossible to do. During the time of Wright Brothers it was flight and in today’s time it’s probably curing AIDS or regenerating a human limb. Regardless, what it is, if you want to be the first modern you then you must find an impossible problem in your society and work at making it possible. Let’s say you want to start a company that clones organs for people needing a donor. Instead of not having enough donors, you want to make it possible for someone to be able to order an organ specific to their blood type. Everyone says it’s impossible to do this and even if you’re able that you’re playing with “Gods” work, but you’re not concern with this. You have a strong connection with wanting to save lives with organ donation, so you get to work and build the very first organ company that clones organs for people needed a transplant. You worked in cost, space, transportation, and everything is in order. You have just made the impossible possible, but is it enough? People will shout your name from the rooftops, but there’s a problem. Another person has figured out a way to engineer the human body to enable it to regenerate any part of the human body. They call it human-liver cross regeneration and it has bankrupted your company. Do you see what went wrong? You discovered the impossible and made it possible, but you didn’t keep discovering. If you want to be on the top of business chain and continue to grow your assets then you must always be on the journey of discovering new and impossible ideas that no one dares attempt because of the risks and technicality of it. A maverick doesn’t stop being a maverick because he decides to follow the rules, but the group decides to follow this fearless leader. But beware, if you begin to lead the group you will get lost in it. Don’t let the trends of you market get too close to you. You want to be the leader of innovation, research, and discovery of radical concepts that propel your business. Hutson didn’t become the first modern receiver by following whatever the pack did, but he got away from it and started to do his own thing. What worked and everything worked. Discover the impossibilities of the business that you love and then use the principles to turn the impossible, possible. When you work for a company and begin earning a paycheck you work under their rules. When you take a break, when you eat, how you dress, how you speak, the tone of your speech, how you address your supervisors, everything is decided by that company. You don’t have a choice. It’s either work for them or quit. These people that control your life while you work are the bosses and they also live under the rule of higher authority as well. Don’t fall into this trap. The entrepreneurs of the world want you to think that the only way to earn a buck is to work under another person. This is not necessarily true. If you want to be successful in business you will be wise to keep this in mind: decide the reality that suits you best. If you’re tired of working under some else and you want to be your own boss then you have to stop letting others decide your reality for you. Hutson didn’t give in to the pressure around him and throw like everyone else. He threw passes no one ever saw coming. His techniques were so revolutionary that some of them are still being used today. He broke away with traditions and decided on the reality he wanted to live in. Follow Don Hutson’s advice and let your desire be the only thing that guides you. If you want to be the owner of your own restaurant and the people in your realm of influence are speaking against it, you need to be able to turn those voices off. Don’t give it a second thought and follow what lies between your heart and brain. People that aren’t successful like to be in the company of other unsuccessful individuals, and if those people are your friends then they might resent you for trying to turn yourself into something better. They may see it as an attack on them and how they should be doing something more in their life. These people are toxic individuals and you need to get away from them. The only thing that matters is your goal and the best way to reach that goal. Anything that lays in your way needs to be removed. It’s that simple, even what needs to be removed are your closest friends and family. A friend or family member should understand that you come first in your life and if your dream is to reach for the starts then who are they to tell you otherwise? You don’t owe anyone anything. Every deed of goodwill done to you was for the act of the goodwill and not for a po-tential favor down the line, so don’t think you need to sacrifice your reality for a friend, family member, or significant other. If your circle of friends and family need your help then, by all means, help, but don’t confuse helping with sacrificing. An example that comes to mind is an older sister forsaking college, so she can’t work and support her baby sister while you parents stay in jail. This is a tough situation, but let me say this again. Don’t let other’s decide your reality for you. The world may call you selfish or evil, but who are they? They’re just the world. In business, who matters most is you. You’re the one taking all the risk, doing the work, selling your idea, so you can’t get bog down with other people’s problems. Plus, a situation as bleek as the older sis-ter’s dilemma is never black and white. Find the shade of grey that works best for you and get to work. A miracle is only found when it is sought. Sometimes it’s easy to get lost in the idea of a new concept. People are always looking for the new toy to play with. Old ideas get stale easy when people are jumping around latest buzz. This is great when the new idea is really needed, especially in arcane institutions, such as Ameri-can politics, but in business it’s a little different. The latest buzz isn’t always the greatest idea, and so people forget to take a step back to the old idea and see if they can shine a new light on it. Nowhere can this be seen better than in the stock market. Brokers always seem to jump on the latest tool to analyze trends, but what is needed in a good investor is not a slew of tools. An investor needs to master a few techniques to understand trends and then stick with them. But, if the broker listens to all the new ideas on which stock, bond, or option is hot then they’ll be lost. The reason why people fail in the stock market is not because they invested in bad stocks, but they let their emotions get the best of them. Take the old idea, “A steady hand is a heavy purse.” This idea of remaining calm is a good one, and it’s something that people in business should observe more. However, what do the majority of new business owners do? They don’t research their market before they get in it, they take out a loan so now the stakes are high causing more stress, and they don’t work as close to 24 hours a day as possible. Old ideas can make you very rich if you only have the mind to pour a little of that 21st creative energy juice on it. In the business world sometimes you have a great idea and you’re about to make millions of dollars, but something seems off. Whatever you try to do, nothing seems to come out right. It feels like you’re in a canoe and your rowing upstream, trying to fight the current. This can happen to you and there is a very simple solution, simply turned your canoe 180 degrees in the other di-rection. Everything for you to be successful is there, except for one thing, you’re approach is off. Somewhere along the line your compass started pointing you in the opposite direction and weren’t aware of it. This happens to some people ever now and then and the solution lies in the opposite of what they were doing. When things go wrong, turn the wrong on its head and see if the ideas don’t immediately pour out. I’m sure this technique will get you out of those situations that seem hopeless. Parents use this concept when they use reverse psychology, but apply it to your business. The next time you’re in a business meeting and your boss wants you to do something that you don’t think it’s right, trying turning your approach 180 degrees. It just may land you that big promotion you always wanted, or set you on the right path. These comments are poison for you and it will be hard not to listen to them, especially when you encounter those first few strings of failure. Failure at business is inevitable because it’s part of the process. I like to consider failure as a test for the strong. The weak will give up at the first sign of trouble, but the strong who can persist are worthy of the rewards that business has to offer. Nothing succeeds like success is true, but nothing fails like failure is also right. When you are in the middle of failure, it will seem like the pain will last forever. Nothing you do is working and your money keeps going down the drain. This is the moment when you need to quietly reflect on your process. Where does the problem lie, should be ask? If calm and collected you will eventually find the path to success, but if you lose yourself to emotions then your mind will be cloudy. Instead, tune your mind to your goal and get to work. Let the negative comments of your project go in one ear and out the other without affecting you. You must practice the art of non-resistance as the comments come in one after another, especially when it’s a customer that is tear-ing you a new one. Customers are always right and letting their petty comments go may be one of the hardest aspects in business, but all you need is one bad review to ruin your reputation. Grit your teeth and let the losers worry about the naysayers. Your only concern is with your soon to be realized success. Don Hutson didn’t reinvent the throw, but just discovered a way to throw it better. He saw what everyone else was doing and said to himself, “What if I pass the ball this way?” And he did it. If you’re feeling overloaded and swamp with having to be this crazy, modern, genius to be successful in business then you may be taking these principles as law instead of suggestions. You don’t need to cure cancer to get the noble prize (it helps, but not necessary). The on-ly thing you need is to find a better way in doing things than the rest of the competition and then you’ll soar through the competition. A barista that works to make the perfect cup of coffee eve-ryday may discover a better way to grind his beans or pour his shots. If he’s smart he’ll keep his ideas to himself and compete against Starbucks, but most likely he’ll tell his manager and lose his idea forever. Sometimes you may think you need to fly when the solution is something more clever and easier to implement. Instead of flying you may want to teleport between locations. Now, I know you’re going to say that I’m talking crazy with teleporting and what have you. You will say I’m talking Star Trek language, but I am and I’m not. With the discovery Higgs-Boson particle, or more affectionately called the God Particle, things like inter-dimensional travel is not a thing sci-ence fiction anymore. Remember we are talking about being the first modern you, so why can’t that include things that have only been discussed in science fiction books. You cannot limit your success because something sounds too fantastical. The greater the innovation the greater the profits, because you are being the first to introduce a new market in the world .Before the Wright Brothers everyone laughed at the thought of commercial travel. Everyone laughed at Henry Ford for his automobile, but the people that get the last laugh are always the people who dare to dream big. You probably laughed a little when I mention teleporting, but I want you to relish that idea and consider it a possibility. The reason I ask you to do is because if you can increase what you be-lieve to include even the craziest of crazy ideas then you will never find yourself with a re-striction or limit you cannot overcome. This takes times, but really think of what is possible and think why people say it is possible to do that? Don’t limit yourself to the ideas of other people, but expand your horizons until they reach the level of infinity. If flying is the only thing you’re use to then you may need to go out and experience new things so you can link them to your business. Remember nothing is too crazy if it includes a wide profit margin. Don’t let your good idea go to waste, and don’t feel like you need to be an Einstein to be successful. It really doesn’t take that much except passion and persistence. With these two things two traits you will be successful and if you find a better way to fly then you’ll soar throughout the business world as one of the great leaders of our generation. Just one reminder, don’t forget to look down every now and then. 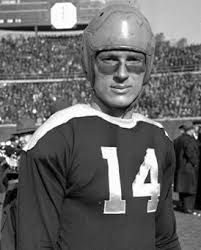 Don Hutson would never be able called the Modern Wide Receiver if he kept with the times of his day and its methods. He had to go beyond the thinking of the time and discover a new imagination that old age could not think of itself. When he did this he blew the competition away to such an extent that left the people of the old age extinct, and ushered in the new era, the era of Don Hutson. People call this modern, but it really isn’t. Modern means up-to-date, but nothing is al-ways up-to-date because once it is dated it is already old. Modern should be only thought of as a blink in time instead of present time and if you want to be the blink then you must close your eyes to the way things were done and how it should be done. You have a second to make a change that will last a lifetime. If you want to be able to create this second for your business you must be willing to dare to be new. Everyone likes the idea of creativity and to be the head of the curve, but being the first person to do something is actually a scary thing. When you are introducing a new idea that means you are being the first and most likely going up against the standards of the day. When you take at Hutson and his drive to go against the standard of not using passing plays then you have to realize that Hutson was risking his NFL career to play a style of football that was frowned upon. Luckily for him, he had a coach that was willing to try new ideas and didn’t have such a strong aversion to passing plays, but what about you? How are you going to leave behind the old age and the ideas that go with it? How will it better than what is already set in stone? These are questions that must be ask because if you are to succeed in any business you must be willing to experiment with different and more innovated ways. Just because no one made money in that line of work doesn’t mean it can’t be done only the forbearers lacked the innovation to make that field lucrative for them. There are more profits to be made in what is thought to be impossible than in any other field known today. Just think how Bill Gates, Steve Jobs, Mark Zuckerberg, and all the other extremely rich became rich. They found the innovation in fields that no one thought was possible except them, after all who uses personal computers and social media sites like Facebook? Wasserman was right on the mark when he wrote this for the character Miguel de Cervantes. If you want to be the Modern You of your new era then you must leave the old age behind and everything involved with it that doesn’t make sense to you. The Wright Brothers didn’t discover flight with their makeshift bicycle plane by listening to the old age, but they took flight by their own right and left the old era to rot away as they blossomed into their own reality. You can strive in business by becoming the Modern You and blow the competition away with never before seen high-passes, just like Don Hutson. When you move within your era you move within your own momentum, and when this happens, anything is possible.